Albatera is a small town in the Vega Baja region on the Costa Blanca in Spain, and although it is only 30 minutes from the coast, it is a popular choice for people looking to move inland away from the crowded coastline. The streets in Albatera are lined with quaint white-washed townhouses and palm trees. Artefacts found in the area give testimony to Albatera being inhabited in pre-historic times. The Romans invaded in the 3rd century BC and left their mark with a system of irrigation channels. The Arabs invaded in the 5th century and held control until it was re-conquered by Alfonso the Wise (Alfonso X) in 1266. In 1296 Jaime II King of Aragon integrated Albatera along with Cox and Crevillente into the kingdom of Aragon and granted the Moors of these 3 villages safe conduct to return to their former places of residence. The agreement of Elche 1305 set the boundaries of Castilla and Aragon as north and south of the Segura River - the southern area including Albatera and Crevillente going to Aragon and Cox going to Castilla. In 1609 the Moors were finally expelled and the language and writings of the region became exclusively Castillan. In 1833 Albatera became part of the province of Alicante. The economy of Albatera is mainly based on agriculture and industry, and with a complex network of canals and irrigation channels, some dating back to Roman times, mean that 60% of Albatera’s cultivable land is now irrigated, creating a landscape of lush green scenery set against the dramatic backdrop of the Sierra de Crevillente mountains. The area has a wonderful Mediterranean climate with the Segura river basin having the lowest rainfall in the whole of Spain. Citric fruits, vegetables and dates are some of the typical produce grown, which farmers take to markets throughout the province. In addition to agriculture, hemp products such as brooms and brushes are also produced. 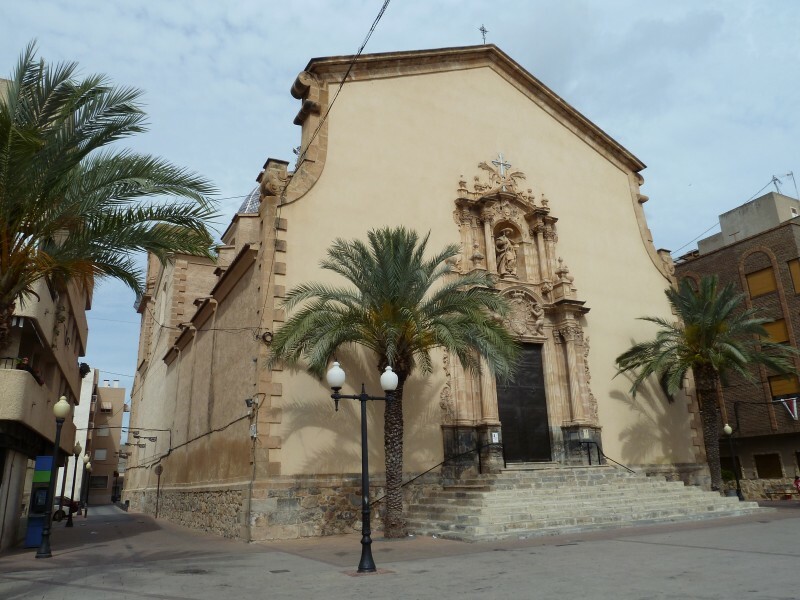 At the centre in the plaza is the most important monument in Albatera, the beautiful Catholic church of Santiago Apóstol, built in 1727. The church is famed for its elaborate baroque doorway, intricately carved in stone. Also in the plaza are the town hall and the old casino. Albatera has all the amenities you would expect in a small town – shops, bars, restaurants, were you can sit and watch the world go by whilst having a drink and tapas. Albatera is surrounded by natural areas of plains, wetlands and mountains. With views of the surrounding mountains the Parque de la Huerta (Park of the Orchards) stretches to 30,000 square meters of gardens, with a lake, fountain and a variety of marked out walking routes. In the heart of the park lies the impressive outdoor auditorium that seats 3,000 people, which was opened in 1999 and hosts musical events and is a social area for residents. The impressive Albatera Golf and Country Club is just 6 kilometres to the north of the town. One of Albatera’s best known festivals is held in July in honour of Saint James the Apostle. Another festival is the famous “Moros y Cristianos” (Moors and Christians festival) also held in July. Albatera is a very accessible town, situated between the capitals of Alicante and Murcia provinces. Albatera is 30 minutes from Alicante, 25 minutes from Alicante airport, and 40 minutes from Murcia's San Javier airport. Albatera is a truly traditional Spanish town with good Spanish values. It is not surprising that Albatera is a popular place to live. See below to view a selection of our bargain properties in Albatera.